BOLTON VALLEY, Vt. (March 16, 2018) – Bolton Valley Resort, located high in the Green Mountains of Vermont, has lately been measuring snowfall in feet, not inches. The resort has received nearly 7 feet of snow since March 1, 82 inches to be exact. Last week the mountain saw 25 inches fall between Wednesday and Sunday (March 7 – 11). Skiers and riders were ecstatic to see over two feet of snow fall in a few short days. But there was plenty more still to come as it started snowing again at the mountain on Tuesday morning, March 13. Since then snow has been falling pretty much non-stop for four days. As of 3:30pm on Friday, March 16, the four day storm total stands at over four feet of snow, (49 Inches) and it is still snowing. The resort has all 71 trails and six lifts open. Powder conditions can be found all across the mountain. 2018-19 All Access Season Passes are on sale now and skiers and riders can ski for the rest of this season for free when they purchase a pass for next season. Also, skiers can ski for the next five seasons for less than the price of four seasons with the new Five Year Green Pass. Bolton Valley offers 71 trails for alpine skiing and riding, over 1200 acres of high elevation backcountry terrain, 15km of groomed Nordic trails, a complete Sports Center plus Vermont’s most extensive top-to-bottom night skiing and riding. 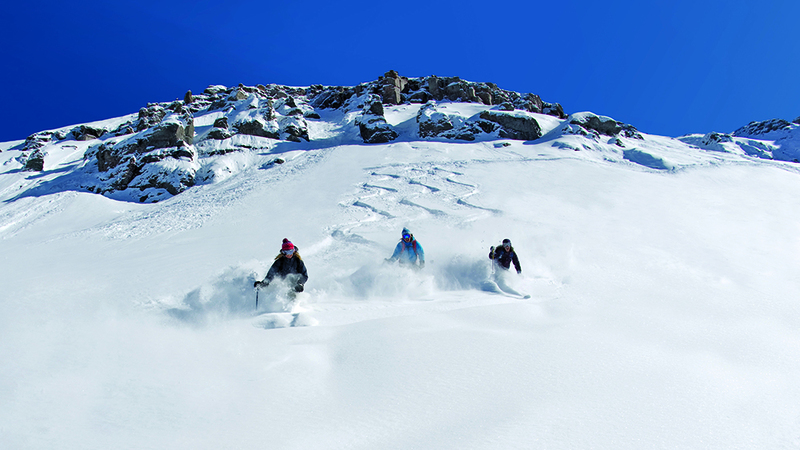 All-inclusive, true ski-to-your-door lodging packages are from $75/person/night. For more information, visit www.boltonvalley.com or call 877-9BOLTON. Windham Mountain in New York’s Catskill Mountains, will have a new high speed six- passenger lift as well as RFID ticketing for the 2018-19 season. A new, high speed, detachable six passenger chairlift will be installed at Windham Mountain Resort, in New York’s Catskills, this summer. The new Doppelmayr lift will run from the base area to the summit, replacing the current Whistler Triple, better known as “F Lift”. It will have a slope length of 5,105 feet, and an uphill capacity of 3,000 people per hour. The ride from base to summit on the new lift will be just under five and a half minutes. Removal of “F Lift” will begin in April and installation of the new lift in May. Whirlwind Express (A Lift), the high speed, detachable quad that runs alongside “F Lift”, will remain in place and will run this summer, servicing the Windham Mountain Bike Park and skyrides. The Bike Park opens for the season Memorial Day Weekend and will be unaffected by the construction. The new lift will be accompanied by state-of-the art lift access, with the addition of RFID ticketing and gates for the 2018/2019 season. The “Axess” radio-frequency identification technology will eliminate the need for guests to present their lift ticket or season pass to a lift attendant prior to loading all base area lifts. RFID Cards can be reloaded via a home computer or smartphone, and can be used season after season. “RFID ticketing is essentially ‘EZ-Pass for skiers’. It will provide easier access to lifts and more accurate scanning of tickets and passes, helping skiers and riders get on the mountain faster, skipping the ticket windows and lift line scanning process.” said Chip Seamans, General Manager of Windham Mountain Resort. All guests will now have the option to sign up for Resort Charge, by attaching a credit card account to their RFID card. This eliminates the need to carry cash or a credit card on the mountain. Resort Charge is accepted at all Windham Mountain Resort operated restaurants, eateries and retail locations. The new chairlift and RFID system represent $6.5M in capital already invested toward the 2018/2019 Winter Season at Windham Mountain Resort. More details on installation progress and a name for the new lift will follow. Guests are invited to become a 2018/2019 Season Passholder at the annual Season Passholder Party on Saturday, March 17th, when the best rates on passes will be offered for one day only. Passholders will enjoy a complimentary buffet and live music at the party. Windham Mountain Resort is a year-round destination in the Great Northern Catskills of Greene County, NY, about two and a half hours north of New York City. With 285 skiable acres, Windham offers 54 trails serviced by 12 lifts. The Resort includes six terrain parks, learn-to packages, ski and stay packages, dining options, an Adventure Park, the full-service Alpine Spa, night skiing, and much more. In the summer months, Windham Mountain Bike Park is famous for its World Cup course, but also features a three-mile-long beginner trail. Windham Mountain Country Club is an 18-hole public golf course with a private club atmosphere. Windham Mountain Resort, 19 Resort Drive, Windham NY, 12496, 800-754-9463, info@windhammountain.com, www.windhammountain.com. Paraolympic skiing competitor Staci Mannella (left), and her guide, Sadie Debaun in PyeongChang. WINDHAM MOUNTAIN RESORT, NY – Windham Mountain Resort, renowned for its adaptive skiing program, is honored to have sponsored U.S. Paralympics Alpine National Team member, Staci Mannella, s she made her way to the 2018 Peoyong Chang Paralympic Games. Staci first discovered skiing with the Adaptive Sports Foundation at Windham Mountain when she was just four years old. Legally blind due to achromatopsia, a genetic eye condition she was born with, she started skiing because it was an activity that her family could all do together. She quickly progressed from skiing with a bamboo pole between two sighted skiers, to out skiing her instructors, to competing in her first national championship at just eleven years old. A limitless dreamer, Staci’s career thus far has included four national championship titles, a world cup gold medal, and representing the United States in the 2014 Sochi Paralympic Games. Staci and her current guide, Sadie Debaun, have been skiing together since December of 2015. They’ve secured four world cup gold medals, three world cup silver medals, and a bronze medal at the 2017 World Championships. The two have high hopes for Peoyong Chang. Windham’s support of Staci is a testament to the Resort’s long-standing relationship with the Adaptive Sports Foundation. The non-profit organization provides life changing experiences for individuals with physical and cognitive disabilities and chronic illnesses through outdoor physical activity, education, support and community. The slope side Adaptive Sports Center at Windham Mountain provides athletes like Staci with a fully equipped, easily accessible, cozy place to enjoy a day on the mountain with their families. Staci Mannella is a Randolph, New Jersey native, and at 20 years old, a full-time student at Dartmouth College where she competes on the Dartmouth equestrian team. She aspires to attend veterinarian school after Dartmouth. While her skiing career has brought Staci all over the world, she always makes her way back home to Windham. Windham Mountain Resort looks forward to having Staci on the slopes this season, and to sending her off to the 2018 Peoyong Chang Paralympic Games in March. BROOMFIELD, Colo.— Vail Resorts, Inc. and Telluride Ski & Golf have just announced that the Telluride Ski Resort will join Vail’s Epic Pass in a long-term alliance beginning with 2018-19 winter season, bringing the total to 46 mountain resorts for skiers and snowboarders. Telluride has been rated the “#1 Ski Resort in North America” five of the last six years by readers of Condé Nast Traveler. Vail Resorts’ 2018-19 season passes go on sale in early March at www.epicpass.com. Telluride Ski & Golf, rated the #1 ski resort in North America five out of the last six years by Condé Nast Traveler, offers visitors an unparalleled combination of world-renowned ski terrain, spectacular scenery, unspoiled character, and signature hospitality. Nestled in the 13,000 and 14,000 foot peaks of Colorado’s majestic San Juan Mountains, the acclaimed resort offers over 2,000 skiing acres with some of the most legendary terrain in the Northern Hemisphere. During the winter, nonstop flights to Montrose-Telluride Regional Airport (MTJ) are available from 10 U.S. cities. For more information visit, www.tellurideskiresort.com. Vail Resorts, Inc., through its subsidiaries, is the leading global mountain resort operator. Vail Resorts’ subsidiaries operate 11 world-class mountain resorts and three urban ski areas, including Vail, Beaver Creek, Breckenridge and Keystone in Colorado; Park City in Utah; Heavenly, Northstar and Kirkwood in the Lake Tahoe area of California and Nevada; Whistler Blackcomb in British Columbia, Canada; Perisher in Australia; Stowe in Vermont; Wilmot Mountain in Wisconsin; Afton Alps in Minnesota and Mt. Brighton in Michigan. Vail Resorts owns and/or manages a collection of casually elegant hotels under the RockResorts brand, as well as the Grand Teton Lodge Company in Jackson Hole, Wyo. Vail Resorts Development Company is the real estate planning and development subsidiary of Vail Resorts, Inc. for information, visit www.snow.com. There’s something special about Breckenridge – it’s more than the mountain, and it’s more than the town. Skiers and snowboarders choose Breck for the feeling, the experiences, and the unique culture and the spirit of the community that can’t be found anywhere else. 96-Hour Sale lodging rates start at $99 per night or up to 40 percent off at the Village Hotel. Kirkwood offers small town attitude with big mountain skiing and riding in the deepest, driest snow around and some of North America’s most diverse and challenging terrain. 96-Hour Sale lodging rates start at $96 or up to 30 percent off at the Meadows. Stowe Mountain Resort, now part of Vail Resorts, is also offering the 96-Hour Sale Save up to 50% on lodging stays through the end of the ski season (April 15, 2018). Vail Resorts, Inc., through its subsidiaries, operates 11 world-class mountain resorts and three urban ski areas, including Vail, Beaver Creek, Breckenridge and Keystone in Colorado; Park City in Utah; Heavenly, Northstar and Kirkwood in the Lake Tahoe area of California and Nevada; Whistler Blackcomb in British Columbia, Canada; Perisher in Australia; Stowe in Vermont; Wilmot Mountain in Wisconsin; Afton Alps in Minnesota and Mt. Brighton in Michigan. Vail Resorts owns and/or manages a collection of casually elegant hotels under the RockResorts brand, as well as the Grand Teton Lodge Company in Jackson Hole, Wyo. Vail Resorts Development Company is the real estate planning and development subsidiary of Vail Resorts, Inc. For information, visit www.snow.com. KILLINGTON, Vt. – Pico Mountain is participating in Feel Good Fridays, a collaboration between Powdr Resorts, the High Fives Foundation and local nonprofits to raise money and awareness for organizations involved in the winter sports community. High Fives Foundation has partnered with Vermont Adaptive Ski and Sports to host these special Fridays at Pico Mountain, January 5 & 26, February 9, March 9 & 23, when lift tickets are discounted at $49, with $5 donated to High Fives and $5 to Vermont Adaptive. In addition, there is an apres-ski party with raffle prizes and more. Vermont Adaptive Ski and Sports is a nationally recognized organization that empowers people of all disabilities through inclusive sports and recreational programming regardless of ability to pay. In addition to sports, year round programming options integrate environmental, holistic wellness, and competitive training philosophies for people of all ages with cognitive, developmental, physical and emotional behavioral disabilities. In the winter, skiing and winter sports are offered at Killington/Pico Resorts in Killington, Sugarbush Resort in Warren and Bolton Valley Ski Area in Bolton. In the summer, participants can enjoy sailing, canoeing, kayaking, cycling, hiking, rock climbing, camping, horseback riding and more at various locations throughout the state. Stowe Mountain Resort on December 13, 2016 (photo by Jeb Wallace-Brodeur). Just in time for the holiday season, Mother Nature has gifted Vermont’s slopes with up to two feet of snow this week. This abundant early season snowfall allows for expanding open terrain at resorts and has enticed above average amounts of mid-week visitors. With resorts dropping ropes and making snow, and most of the remaining Vermont ski and snowboard areas planning to open this weekend, Vermont’s open terrain will double over the next week and could be close to 100% open over the holiday. Mount Snow Resort held their annual Founders Day Celebration on Tuesday, December 12 with crowds that rivaled a busy Saturday afternoon. “In what has become a Mount Snow Founders Day tradition, we once again saw a 10”+ powder day correspond with our $12 lift tickets. This meant that our guests paid roughly $1 per inch of powder on Tuesday. Not a bad deal!” said Jamie Storrs, Communications Manager at Mount Snow. Further north, Burke Mountain saw a 60% increase in open terrain from Tuesday to Wednesday thanks to 15 inches of snow overnight. Nearby at Jay Peak Resort, reservations jumped 30% as the storm rolled in with visitors booking for this coming weekend as well as the holiday period. Similarly, in Southern Vermont, 18 inches of fresh snow at Stratton Mountain Resort resulted in an increase in mid-week and holiday reservations. Stowe Mountain Resort, now part of Vail Resorts and its Epic Pass, has had an exceptional start to their season with mid-week skiers and snowboarders expanding beyond Vermont residents to guests from states to the south and north of the border. Director of Communications at Stowe Mountain Resort, Jeff Wise, said that the early season snowfall and cooler temperatures have them planning to open 100% of their terrain by Christmas. Other Vermont resorts that have relished in Mother Nature’s bounty this week include Bromley Mountain, Smugglers’ Notch Resort and Okemo Mountain Resort. Smugglers’ Notch Resort will have top to bottom skiing and snowboarding on all three of their mountains, Morse, Madonna and Sterling come this weekend. Okemo Mountain Resort expects to double their trail count from last Saturday, December 8th to this Saturday, December 16th and Bromley Mountain began their weeklong operations a day early thanks to the natural snowfall. Vermont’s cross country centers welcomed over 15 inches of snow to their trails, too. Centers like Trapp Family Lodge and Blueberry Hill Outdoor Center reported winter wonderlands on their properties, with Trapp Family Lodge operating 8 km of trails and Blueberry Hill operating 57.3 km. Kingdom Trail Association and Rikert Nordic Center are 100% open, with many other cross country centers opening more terrain in the coming days with added snowfall. As the snow continues to fall across the Green Mountain State, stay up to date with Vermont’s most recent trail conditions and weather alerts at SkiVermont.com and explore resort information, deals and events via the Ski Vermont Resort Finder.